Learn principles to help you manifest oneness through inner peace and self-knowledge. Oneness helps you focus on that “I can do it” attitude that will cause you to open your heart and appreciate all the wonderful things that living in oneness has to offer! This exploration of what it means to be human, the limits of national and racial identity and the mind’s relationship to the body is blended together into an era-defining vision of individual and cosmic transformation. Ultimately, it is only when readers are ready to face the inner psychological causes of war and racial discord that true healing, world peace and oneness finally begins. Whether you need an inspiring thought for the day, an affirmation to keep you uplifted, or some words of wisdom to get you motivated, you’ll find the perfect way to greet each day with Oneness: Principles of World Peace. Global unity is where mankind is seen, factually, as undifferentiated. The superficial physical and cultural differences have been seen as unimportant due to the power of your degree of realization of your true identity. As the idea of race and the psychological process of racial identification cease to have emphasis, they will wither. In this realization, this sense of global unity, you are free. There is no room for hurt feelings, fear, demands or expectations. These are all petty things of the mind. Global unity brings with it a compassion that is not based upon guilt, shame, fear or legislation. Global unity is manifested when humanity’s true nature garners greater attention, importance and significance than theories of racial and national separation or division once did. Global unity as human awareness is the timeless solution to the necessary relationship of mankind, one to each other, for it is ever and always of the now. You are free; free to experience the genuine fact of your essential sameness to all humanity. When humanity’s timeless true nature is acknowledged and explored freely and individually, that feeling of being separate and apart dissolves and vanishes. The timeless essence of humanity allows for no disruption or disintegration, no dissension or discord. Global unity is the new approach of real change that is innately free of the polarized debate and controversy regarding race and nationalism. It brings a note of optimism in the intelligence of common sense, which is insight out of your individual seeing. 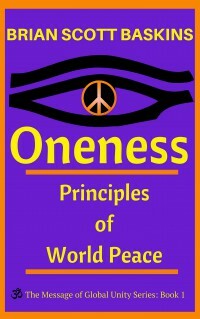 Oneness Principles of World Peace is Book 1 in The Message of Global Unity Series. The enticing aspect of Oneness Principles of World Peace is that every reader can actively participate in world peace right now. This book is comprised of insights that must be personally applied in life in order to enter the ever-available dimension of global unity. Do what is necessary and it shall make a difference. 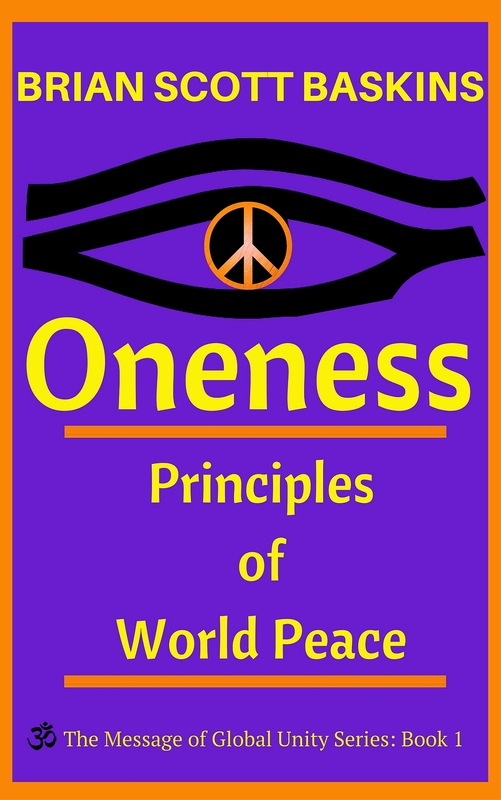 Oneness Principles of World Peace establishes a direct partnership between the reader and everyone on the planet for working together to successfully address the many problems created by racial and national identification. Open mindedness is the only thing that can prepare you for what awaits you: a heartwarming affirmation of global oneness. Once you enter the complex maze of racial and national identity there are no road signs to keep you from zigzagging and further straying from reality’s exit. Readers receive tips for navigating the maze through six principles of mindfulness: from self-knowledge, monitoring conditioning, freedom, realization, to understanding racial conflict in a whole new way and the reader’s individual expression of global unity. Go deeper into oneness, understand oneness on different levels and continue to better your life with these enlightening and inspiring principles. 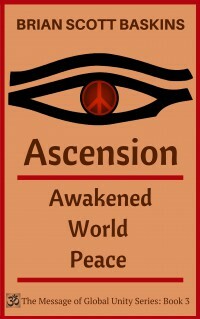 Come, realize “I am what you are” truly evokes the purest form of oneness. This debut title from Brian Scott Baskins is a new addition to the great non-dual, mindfulness and meditation tradition of Neale Donald Walsh, Jiddu Krishnamurti, Eckhart Tolle and Thich Nhat Hanh. 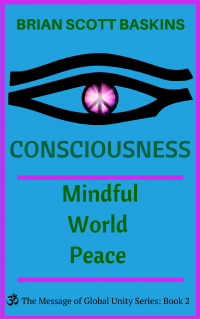 This Mind Body Spirit philosophy book advises that world peace is in plain sight through the reader’s glimpse of the essential nature already uniting humanity. Baskins phrases these insights with populist clarity. This is a persuasive book pointing out that you only gain access to world peace through mindful meditation in the moment. Read this book and receive your realization that immediately admits you into the dimension of global unity and a truly free global society founded on world peace. Check out other books in The Message of Global Unity Series! The book contains over 50 pages full of principles, perspectives, wise sayings and advice that are easy to absorb. Says Brian, “If I can help just one person with my writings the same way many writers have helped me, I will feel truly successful. Brilliant, quirky and courageous, his serious, lively and illuminating non-fiction is concise with words that will change the world. Read Oneness for FREE on Kindle Unlimited!